How do I Edit the List of E-mail Recipients in a Notification? I have a form set up that emails a bunch of diifferent people I need to see who it is emailing and edit the list. I have tried opening the email notification and can not see addresses of who it is being sent to. Incidentally, if you need to see all of the email addresses simultaneously, click the Recipient E-mail box and then hit [Ctrl+A] to select all of its contents and then [Ctrl+C] to copy it to your computer's clipboard. Then, open a text editor and paste [Ctrl+V] what was copied. This feature is not working for me. I used the comma space method for only 2 email addresses and am only receiving the test email to the account owners email address. I checked your account and dont see any form created yet. Please let us know your form ID and we will investigate the issue. 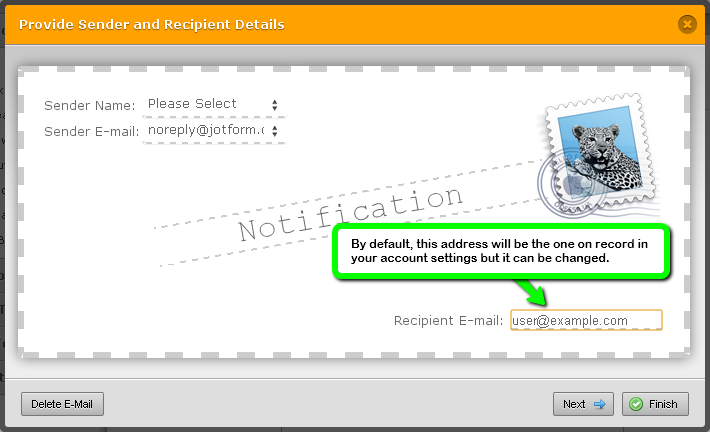 It worked when we tested the form, but not when we set up the notification and tested the email from there. I am a form sub user. All set since it actually works, just spent a while trying to figure out why it didn’t from the notification portion. Let me please explain, the 'Test Email' button is sending a test message only to account email, while the real form submissions are sending to email notification recipient(s).